24 November 2018 – 14 April 2019: New exhibition at Weston Park Museum, Sheffield – Who We Are, photographs by Martin Jenkinson, as featured in the Guardian. You'll be £14.99 closer to your next £10.00 credit when you purchase Images of the Past: The Miners' Strike. What's this? In addition to being the most bitter industrial dispute the coalminers' strike of 1984/5 was the longest national strike in British history. For a year over 100,000 members of the National Union of Mineworkers, their families and supporters, in hundreds of communities, battled to prevent the decimation of the coal industry on which their livelihoods and communities depended. Margaret Thatcher's government aimed to smash the most militant section of the British working class. She wanted to usher in a new era of greater management control at work and pave the way for a radical refashioning of society in favour of neo-liberal objectives that three decades later have crippled the world economy. Victory required draconian restrictions on picketing and the development of a militarised national police force that made widespread arrests as part of its criminalisation policy. The attacks on the miners also involved the use of the courts and anti-trade union laws, restrictions on welfare benefits, the secret financing by industrialists of working miners and the involvement of the security services. All of which was supported by a compliant mass media but resisted by the collective courage of miners and mining communities in which the role of Women against Pit Closures in combating poverty and starvation was heroic. Thus inspired by the struggle for jobs and communities an unparalleled movement of support groups right across Britain and in other parts of the world was born and helped bring about a situation where the miners long struggle came close on occasions to winning. At the heart of the conflict was the Yorkshire region, where even at the end in March 1985, 83 per cent of 56,000 miners were still out on strike. The official Yorkshire National Union of Mineworkers (NUM) area photographer in 1984-85 was the late Martin Jenkinson and this book of his photographs – some never previously seen before - serves as a unique social document on the dispute that changed the face of Britain. As featured in The Yorkshire Times, Sheffield Telegraph, Bradway Bugle and NUJ News Leeds. This book vividly brings together images and the facts of the dispute, one of the longest in British history, and one that divided the country. Whatever your politics, it is a thought-provoking and stimulating read. ...documents with text and striking (no pun intended) photographs, the heartache, the upheaval and the occasional humour which surrounded one of the biggest domestic and political crises of the modern era. We need to learn and relearn the lessons of the Miners' Strike, the way it was fought, the way it was lost and how we can learn from it for future battles. This book will help in that process. A collection of Martin Jenkinson's striking, memorable images of the miners' strike of 1984/5 accompanied by a succinct but comprehensive history of the strike by Mark Harvey and Mark Metcalf. Highly worthwhile. This book of [Martin Jenkinson's] photographs - some never previously seen before - serves as a unique social document on the dispute that changed the face of the UK. If you buy one book on the miners' strike make it this one. This book, one of a number that are being published to mark 30 years since the start of the miners' strike of 1984-85, will most certainly be one of the better ones. It has a fantastic collection of black and white photographs, some familiar and some never published before... A recommended read for anyone who wants to know the real history of the miners' strike. 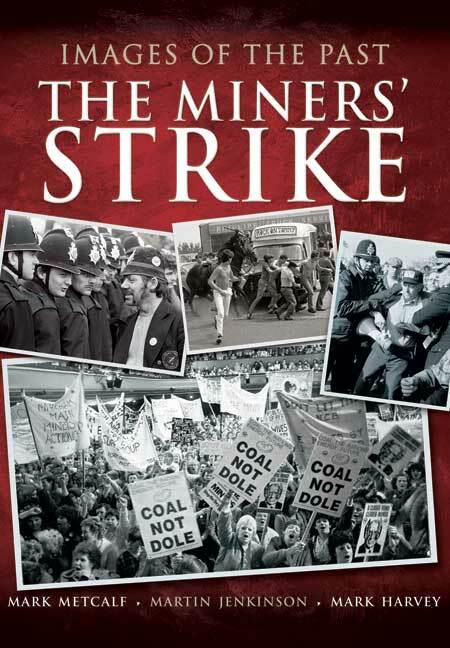 This is a comprehensive collection which captures the mood and intensity of the strike. The most spectacular photographs are from the so-called Battle of Orgreave. Not only are there striking images of miners being arrested but there are humorous photographs of miners playing boule in front of a line of police officers. Almost every aspect of the strike, from soup kitchens to free haircuts for miners at Worsbrough Bridge are included. The text written by Mark Metcalf is also all-embracing. Martin Jenkinson was a freelance photographer who lived in Sheffield in South Yorkshire. Tens of thousands of people will have seen his work in national and regional newsnapers, perhaps without knowing his name. Jenkinson died in February 2012 but the images he produced will live on for decades, carrying messages of working class struggle and determination. All the pictures are enlightening and the story of the strike is told intelligently and with passion by Metcalf and Harvey. If you want to know about the miners, buy this book. years experience of corporate, trade union, portrait and documentary photography. Martin Jenkinson was responsible for some of the most striking images to have emerged from political and industrial struggle in Britain over the last 30 years. In addition to his work with the NUM, Martin was also commissioned by many other unions, notably the National Union of Teachers and the TGWU/UNITE. Martin was a former steelworker who combined his politics and his belief in social justice, fairness and equality with his love of photography. Martin died of cancer aged 64 in June 2012. Mark Metcalf is a freelance writer with a passion for football, especially the formative histories of northern teams. His recent work includes books on Manchester United, the 1960 FA Cup and Sunderland (he's a lifelong fan). Mark has also completed a biography of the Sunderland legend Stan Anderson. Born in County Durham, Mark now resides in Halifax with his wife Ruth and two-year-old son Charlie.